Aubergines might seem like a strange choice of vegetable for steaming, but they really benefit from this treatment. 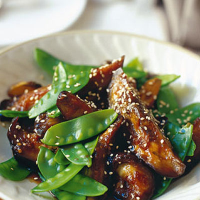 A quick braising in a soy-based dressing adds flavour to the meltingly tender vegetable..
Cut the aubergines in half lengthways, cut each half into 3, lengthways, then halve again. Bring the water in your steamer to the boil and steam the aubergine pieces for 20 minutes, until tender. If they don’t fit in 1 layer, give them a stir after 10 minutes. Combine the mirin, soy sauce, sugar and ginger in a large frying pan and put over a medium heat. Add the aubergine pieces and cook for 5 minutes, carefully turning them in the sauce. Meanwhile, steam the mangetout for 2–3 minutes, until just cooked, then add to the pan with the aubergine. Toast the sesame seeds in a frying pan over a low heat; stir until golden. Scatter over the vegetables. White Pinot Gris wine has all the succulent richness these Asian vegetables need.